See flight from a new point of view! With the Ominus FPV, you not only see your flight through a Wi-Fi®-enabled digital camera — you can operate it using your smartphone or other mobile device*. All you need is your smartphone and the FPVCam app — an app you can download free of charge from Google Play® or the Apple App StoreSM. Everything else is included, right down to "AA" batteries for a 2.4GHz radio. Plus, it's ready-to-fly the moment it comes out of the box. 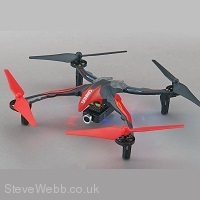 It's stable and easy to fly indoors or out, equipped with bright, colour-coded LED lights for easy tracking and amazingly aerobatic even when the camera is attached. The Ominus FPV is your chance to shoot crisp, clear pictures and videos from a true eye-in-the-sky view — and download it directly to your own smartphone or device. *Smartphone or other mobile device required for FPV flight. Not included. Control your camera with your smartphone! With the Ominus FPV, you don't need to buy a separate viewscreen or expensive headset to watch your flight unfold — just your smartphone and the FPVCam app. Download the app, put your smartphone into the holder, and you have a sharply focused, first-person view of your flight. The Ominus includes a micro memory card and card reader, but you can also download photos and videos directly to your smartphone for sharing with friends or posting to your favourite social media sites. And if you give friends your camera's password, they can watch your flights on their smartphones, too. 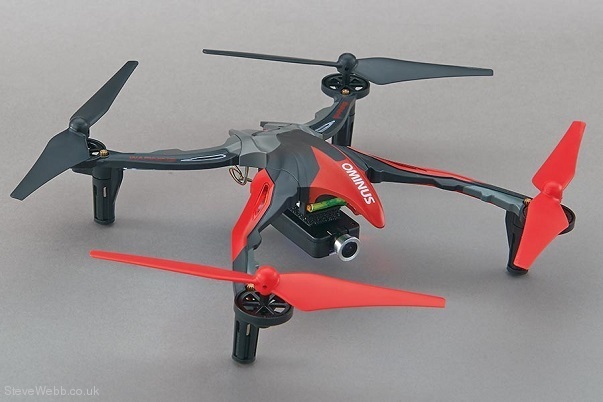 Get your Ominus FPV today...and see how exciting flying can be from a first-person point of view! Note to owners of the original Ominus: Due to the advanced electronics and specialized transmitter the original Ominus cannot be converted or upgraded to the Ominus FPV. 1280 x 720 resolution for crisp, high-definition videos and photos. Attaches with double-sided tape ─ removes quickly for high-energy aerobatics. Comes with a micro memory card and card reader for onboard storage, but can also download data direct to your smartphone or other mobile device. * Maximum range. Assumes an unobstructed view and a “clean” environment. Interference-free and dependable ─ great for flying with friends. Comes with smartphone holder and removable sun shade. Holds a smartphone at the optimum viewing angle, leaving both hands free for simple control. Automatically links with receiver when in close proximity. Includes Easy, Normal, Advanced and Expert flight modes to customize Ominus FPV performance to your flying skills and style. Digital trims for fine-tuning performance. Auto-flip button delivers pro flips whenever you want. Single button for shooting still photos and video ─ separate off button for video for easy control and great results. 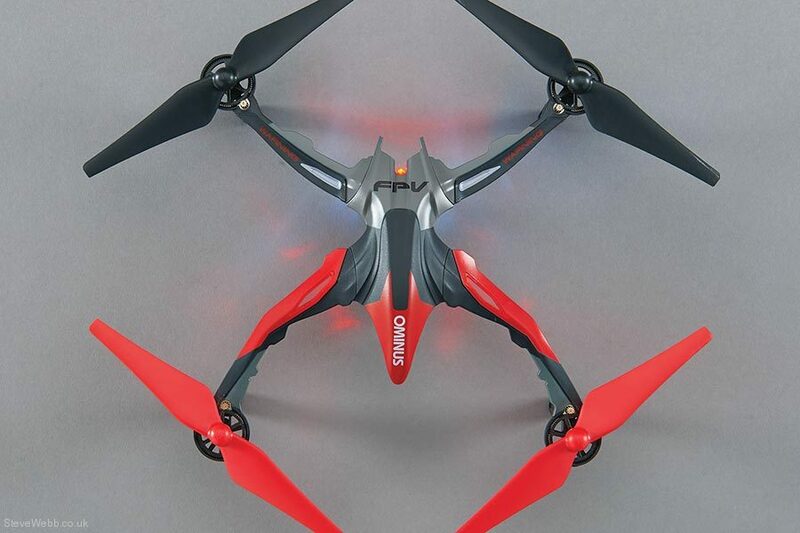 A 3-axis gyro plus 3 accelerometers make the Ominus FPV stable enough to fly indoors or out. Accelerometers can be turned off for greater manoeuvrability. Supports 10-12 minutes of flight on a single charge. Upgraded 35C discharge rate puts more “muscle” into extreme manoeuvres. Compatible with smartphones and other mobile devices for Apple or Android. Requires FPVCam app, a free download available from the App Store and Google Play. Apple and the Apple logo are trademarks of Apple Inc., registered in the U.S. and other countries. App Store is a service mark of Apple Inc. Android™ and Google Play are trademarks of Google Inc. Wi-Fi® are Wi-Fi Alliance® are registered trademarks of the Wi-Fi Alliance.